We are a company founded by two good friends who served their country in different branches of the military, but are both guided by principles instilled within them, in large part, by their military experiences. We have three team members who are veterans of this nation’s armed forces and we take this opportunity to recognize and thank them for their service. We would also like to express our collective gratitude to all of our customers, partners, and fellow Americans who traded years of their lives for an opportunity to serve their country and countrymen while wearing a uniform. Paul entered the Air Force intent on pursuing a career in law enforcement. Traveling all over the world with the Air Force (Saudi Arabia, Iceland, Honduras, Germany), Paul excelled in his chosen assignment, was awarded numerous awards for outstanding service, and enjoyed increasingly high profile assignments, including Presidential Aircraft Support. Toward the end of his tour, he was recruited to join the full time Air Force One protection detail, but decided to return home to the Pacific Northwest and embrace a civilian life with his future wife, Shannon. Frank spent the first two years of his Navy career assigned to a WWII, Tang-class, diesel submarine named the USS Gudgeon, primarily supporting training exercises with the Navy fleet. During the summer of 1983, the Gudgeon suffered three fires and one flooding incident, so the government decided to remove it from US service, ultimately leasing it to the Turkish Navy, who renamed it the TCG Hızırreis. After the Gudgeon was decommissioned, Frank was reassigned to the USS Gurnard, a Sturgeon-class, fast attack, nuclear submarine. This submarine afforded Frank twice the elbow room he experienced on the Gudgeon, and a far superior feeling of personal safety. It was the early 1980s, which meant it was still during the cold war era and Frank’s assignments primarily included patrolling the waters of the Pacific. Frank’s description of the experience involves tracking Soviet ships and keeping watchful eyes on them. It was during this time that Frank learned a trade as an IC Electrician – responsible for alarm, navigational, communications, and many other high and low voltage systems aboard the ship. Always striving for the best of himself, Frank entered the Navy at the age of 18 as an E-1 and achieved E-5 status by the time he was honorably discharged just four years later. Frank commented that as a young father, he struggled with the time away from his family as a submariner, but attributes the time he devoted to the Navy as some of the most important formative years of his life. While in the Navy, he learned the values of personal responsibility, teamwork, independent thinking, and a can-do attitude. 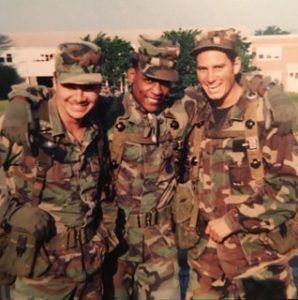 After being honorably discharged in late April 1985, Frank was a business owner within six months and continues to work hard building his business and demonstrating his strong work ethic to his employees and industry counterparts. Brandon followed his father’s footsteps as a Navy Seaman, although he opted to stay above the surface of the water. Early in Brandon’s military service, he demonstrated qualities that placed him in formal leadership roles and an attention to detail that served him well as a supply chain specialist. He served in that role both aboard the USS Carney, an Arleigh Burke-class Destroyer, and as a Port Liaison in the Mediterranean based in Sicily. With a keen eye for process and a strong sense of right and wrong, Brandon built a reputation as a trustworthy and incorruptible representative within a job renowned for being rife with temptation. Some of Brandon’s highlights in the Navy were the opportunities to travel extensively in Europe and South America, with one stand-out life experience of traversing the Panama Canal aboard the USS Carney. Although he has been out of the military for a decade after being honorably discharged in December of 2006, Brandon continues to be a resource his Navy coworkers and friends rely upon for professional and personal advice. This is a testament to the lasting impact Brandon has on people as an individual who leads by example and can be trusted to provide honest, valuable insights. Brandon, like his father, was shaped by his time in the military, embraced the highest values of military service, and we are lucky to have him applying those learned skills and innate talents to a degree in accounting and his chosen career path as CFO for Signaling System Solutions.